So interesting to see the placement of the buttons on the back skirts, particularly the top ones. And the way the back neck was finished. I am amazed, tho, at the depth of your research, and the difficulties you have to overcome in justifying each choice along the way. I could understand that hurdle for someone like myself, a jumped up costumer with no historic archive, but you’re “in the biz” and clearly conscientious about looking correct. Love the shot of you and the cat… Great apron, with its obviously period correct smoke smudges! The little frock is fantastic, isn’t it? I’d love to recreate it. The flaps at the skirts are like mariner’s cuffs– and the use of stripes is quite flashy. Nope, the quest for authenticity involves digging deep these days. There is a juried event at MMNP coming up for which we have been asked to document our clothing choices, even if we’e not participating in the juried portion–at least, that’s how I read the email. If one documents choices, though, eventually I would think you’d get the freedom to play within those choices. The apron still smells like tallow! The cat was swearing about being ejected from the house with the vat of tallow she wanted to eat. She’s one tough farm cat. I have accumulated a large selection of blue and white check linens as a PowerPoint presentation. I would love to have the opportunity to share it with you. Many of the pictures I cannot post because of the agreements with museums. Paul, I would be very interested in seeing what you have found. I’ve looked at one very local sample book, and some extant local garments, thinking about regional variations or preferences in checks and stripes. You can DM me at kittycalash (at) gmail (dot) com, and I can send you more links and unbroken catalog records. I like the nice mention of both a striped jacket (AKA waistcoat) and overalls together. 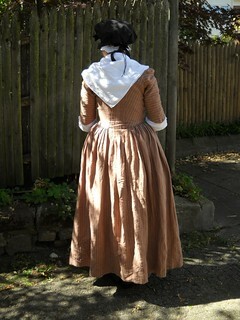 That’s a great look, which we’re just now starting to see really well-portrayed among reenactors. Thank you, Niels. There are some buried references in primary sources that suggest a much more varied (checkered, if you will) appearance of enlisted men and civilians in the 18th century. There are some “striped woolen trowsis” on my to-sew list, based on letters from a Leominster soldier asking his mother to send them to him.